Why not consider Entrepreneurship as your college major or career? Reasons always come first, results come second. Are you interested in pursuing a bachelor’s, master’s, or doctorate degree in Entrepreneurship? How to decide if Entrepreneurship is right for you? One of the most important decisions that you will make in college is to select a major. Such decision should not be taken lightly, as it has profound implications for your career and life after college. A wrong choice today will result in added semesters and tuition tomorrow. * Chapter 4 of this book is devoted to effectuation! * Are you one of those students? Do you feel you are underprepared when choosing a major? * Are you choosing your major based on influence and assumptions? * Are you looking to your adviser, parents, and peers rather than draw conclusions based on your own research, interests, abilities, and self-reflection? A recent research study shows that 80% of freshmen say they are undecided about their major. Most of them will change their minds multiple times even after they declare their major. Even the “decided” students often do not base their decision of major on factual research and self-reflection. The biggest mistake both the undecided and decided students make is failing to research what’s required of the major, and the profession. If you are one of those students, we can assure you with great confidence that this book is for you. Take a deep breath. You need help to make this important decision which will impact the rest of your life. Don’t leave the important years of your life up to feelings, circumstances, or chance. The information in this book is NOT theory. These are not just a lot of nice suggestions. They are proven best practice strategies that work. Although most of the chapters in this book are peer-reviewed, they have been written in plain English in layperson’s terms to give you the best/easiest reading experience. * Why should you choose Entrepreneurship as your undergraduate major or minor? * Why should you undertake a graduate/PhD degree in Entrepreneurship? * What are the research areas/issues and scholarship opportunities in Entrepreneurship? * What are the jobs/career options and best practice tips for the Entrepreneurship graduates? 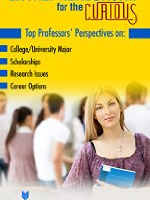 There are many books which claim to help you choose your major. But this book is different. How? First, as opposed to “one size fits all” books, this is the first book ever written solely focusing on Entrepreneurship. Second, as opposed to perspective from a single author, this book provides you with multiple perspectives from the top university professors. Third, as opposed to most other academic/complex books, this book is easy to understand and read. Finally, as opposed to crippling higher prices charged by other publishers, we have made this book available at the price of less than two lattes (or two beers if you prefer). This book contains no fluff, no complex theories, and no sugar coating. This is a serious book. It is presented in a rather fun, non-serious manner. This book is missing one thing—hype. It’s filled with real strategies and real techniques that will give you real results. If you are considering Entrepreneurship for your major, we repeat this is the ONLY book you’ll ever need for your career success. Take this book as an investment in your life. This book is about YOU. Your major. Your research. Your career. Your success. Take action today. So, scroll up and simply click the “buy” button on this page. Start reading your book from your Kindle device, computer, tablet or smart phone NOW!